There were 200 submissions on the Government’s Welfare Working Group (WWG) Issues Paper. Submitters urged the WWG to consider the actual evidence around the way benefits work and to consider the full picture of the complexities of people’s experience. The NZCCSS submission affirmed the principle of social participation as the foundation for the benefit system and not simply “work readiness”. The Dunedin Methodist Mission critiqued the WWG’s assumptions around “dependency” and called for a strengths based approach to the welfare system. The submission by Caritas reminded the WWG that our benefit system is for the good of society as a whole and that there must be a willingness to address the structural causes of inequality, economic hardship and low standard of living. The Child Poverty Action Group (CPAG) comments challenged the selective use of statistics by the WWG in its Issues Paper and suggested we are being presented with a “manufactured crisis”. The Alternative Welfare Working Group has set out to fill in the many gaps in the approach taken by the WWG. They would like to hear your thoughts about a benefit system that is fair and promotes the wellbeing of all people in Aotearoa. Comments can be made through until 30th September online at the Alternative Welfare Working Group website or post to the Alternative Welfare Working Group c/- Caritas, PO Box 12-193, Thorndon, Wellington 6144. Today, the 27th September, the Government implements the next stage of its Future Focus benefit reforms “aiming to break the cycle of welfare dependency”. You could be forgiven for wondering why anyone is bothering with all the submissions and comments when compulsory work-tests for Domestic Purposes Beneficiaries (DPB) and Sickness Beneficiaries (SB) are being introduced, those on the Unemployment Benefit (UB) will have to re-apply after a year, access to the Invalids Benefit will be “applied rigorously” and a tougher line on those receiving hardship grants. Read more about Future Focus changes on the MSD website. So, while beneficiaries have to “prove” their “budgeting skills” to get help in crisis, those on middle and high incomes can prepare themselves for cashing in on the next round of Government tax cuts. From 1st October Finance Minister Bill English will pocket $13,305 extra of his annual salary of $276,700 while a person on the Unemployment benefit will receive a $3.92 more per week ($203 per year) and will have to prove his or her budgeting skills to get a maximum $200 food grant to cover the increase in GST. NZ Superannuitants have received the best deal of those on Government benefits because they receive the GST compensation plus tax cut. Other benefits are also taxed but the benefit amounts are calculated on a net income basis. As a result a single superannuitant living alone will receive an extra $15.63 per week ($31.26 per fortnight) including the effect of tax cuts and the adjustment for the effect of GST. On an annual income of around $15,000 a single supperannuitant is hardly living in the lap of luxury though. 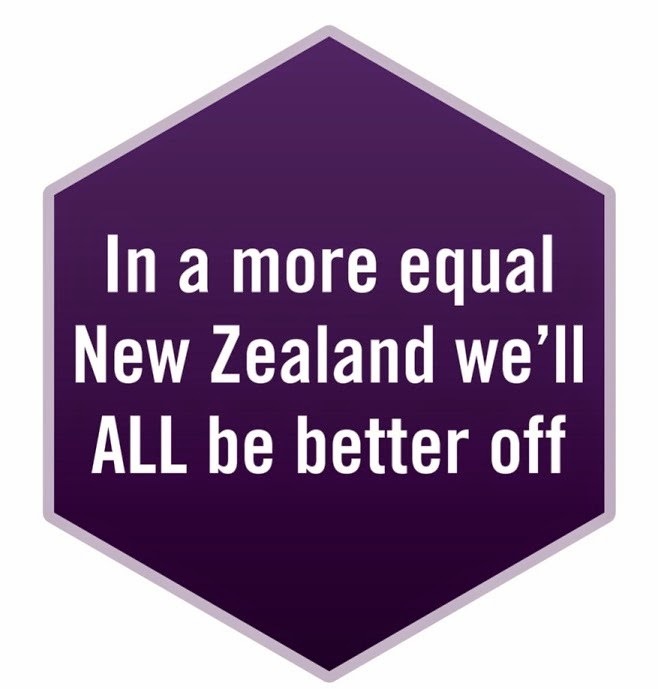 While the Government maintains that the “vast majority of New Zealanders will be better of”, it is clear that the tax cuts and GST effects are significantly skewed against those on lowest incomes, they benefit the least from the changes and as result economic inequality will continue to grow (see Colin James comments in The Press). Removing GST on food is one response set to be debated. The Maori Party already has a bill before Parliament on this (Rahui Katene) that was voted out by the National and ACT Parties (read the speeches from the debate online on Parliament’s website). In her speech to Parliament, Rahui Katene quoted Public Health Association Director Dr Kay Keating, saying it would “be a great start towards lowering the high rate of avoidable disease, hospital admissions, and premature deaths that plague lower income families”. The Labour Party is apparently about to announce a new policy on this and although the standard argument against this is that it makes the system more expensive and therefore less “efficient”, Gordon Campbell has written a very good article that points out that Australia manages to do this without it proving very difficult or expensive – Do The Right Thing. Big increases in overdue debt is one of the huge challenges facing low income families reports the NZ Federation of Family Budgeting Services in its press release on their latest statistics for the year ended 30th June 2010. CEO Raewyn Fox comments that “The common trends we see each year are: the numbers of clients go up, their average debts are larger, and their financial situations grow ever more complicated.” Read more on the NZFFBS website. Local Government Elections on 9th October are coming up and throughout the country candidates for councils, district health boards and regional councils are attempting to gain the attention of the voters. Just as voters might have been tempted to believe that councils “frivolously” fritter all their money away on such “non-core luxuries” as community services (such as community centres, swimming pools, parks or libraries), Local Government NZ has come to the rescue with 45 pages of “Mythbusters” about local government. Less than a fifth (18%) of their spending goes in these areas, most of the rest really is spent on roads, water and waste. Local Government Mythbusters is online at http://www.lgnz.co.nz/ (can’t wait for the TV show!). You can ask your candidates questions and find out about who is standing online at the 2010 Elections website which explains the voting system, helps you find the candidates and also includes an online Q&A for candidates (not exactly overrun at time of reading!). NZCCSS is right behind the call from the Housing Shareholders Advisory Group for significant investment in the community housing sector contained in the Home and Housed report. Submissions from NZCCSS, Community Housing Aotearoa and others highlighted the urgent need but also point to the range of other policy actions that will be necessary to address the massive gap between the number and affordability of houses being built and the urgent needs of low income renters and those hoping to achieve home ownership. As CHA points out, if HNZC feels, as stated in the report, that it “has one arm tied behind its back” then by comparison community housing organisations have felt more like their legs have been tied together! Maori housing organisations are looking to Te Puni Koriri to lead Crown agencies in responding to the distinctive needs of Maori. While most Maori land is rural and held under diffuse and complex ownership arrangements that make development more challenging, 80% of Maori live in urban settings and they are hugely disadvantaged by the whole range of housing affordability issues. The report on the Maori Housing Conference held in March includes a call for Treasury to review the adequacy and effectiveness of HNZC’s lead role in Maori housing provision, policy and processes and assess the capability of TPK to undertake a more active role. Read the full report on the CHA website: A Call to Action from the 2010 National Maori Housing Conference. Eight years of life – this is the price of inequality for young Maori girls and boys in Aotearoa. This is one of realities facing tamariki Maori today, that their life expectancy is eight years shorter than that of non-Maori. Their voices and those of other children and young people are presented through three separate reports prepared by Action for Children and Youth Aotearoa (ACYA). Tamariki Maori reports on Maori children and young people. Together with Save The Children, ACYA produced Hear Our Voices, New Zealand’s child participation report to the UN Committee on the Rights of the Child. It presents the child and youth perspective on their well being in Aotearoa/New Zealand and comes from a series of focus groups held with 199 young people throughout Aotearoa/ New Zealand from May 2009 to April 2010. See also Children and Youth in Aotearoa 2010, the NZ Non-Government Organisations Alternative Periodic Report to the United Nations Committee on the Rights of the Child. First it was a new Board, then CEO George Nimmo announced his retirement this week and now the announcement comes that Careerforce and the Social Services ITO are commissioning a feasibility study to explore combining the two organisations. This move will be of great interest to NZCCSS member agencies who employ staff covered by both of these sector ITOs. Read more on the Careerforce website. Canterbury people are showing their resilience but the strains are also real, as the journey back to normality is negotiated through continuing aftershocks. NZCCSS Executive Officer, Trevor McGlinchey is in Christchurch today meeting some of our agencies who have been affected and finding out about responses and the general situation for people on the margins. Methodist Mission Christchurch or Salvation Army Earthquake Appeal. Residential Aged Care into the Future – The need will be there. How will we respond? The population is aging. Can we do better with the resources we already have in the sector? How can we improve collaboration? How can we improve clinician leadership? Responding to the recent release of the Aged Residential Care Service Review, the Rod Perkins from the Selwyn Foundation is inviting non-profit organisations to attend this workshop. Cost $200 contact trishp@selwyncare.org.nz to register. Jigsaw's 2010 Conference ‘Every Piece Matters’ being held at the Grand Chancellor Hotel in Christchurch on 28 and 29 October. Find out more at the conference website. Jim Wallis, Founder and CEO of the Sojourners Community - Can Public Policy be Christian and Should it Be? Wednesday 29 September Government Building Lecture Theatre 4. An international commentator on faith, ethics and public life, Jim Wallis is founder and CEO of the Sojourners Community based in Washington DC. Jim Wallis is also speaking at the Just Action Conference in Auckland 29th – 30th September.